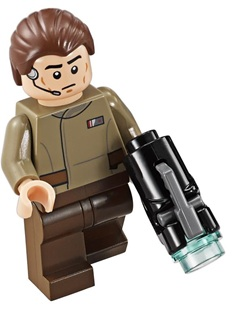 A Resistance Officer is a Star Wars minifigure released in 2016. This Resistance officer is unique to the set 75131 Resistance Trooper Battle Pack. The officer has a dark tan torso depicting their uniform, and their rank in the Resistance Army. He has a Light Nougat head, with a headset, cheekbones and a concerned expression. The hairpiece is the same as Bruce Wayne's, but in a brown color. This page was last edited on 1 September 2017, at 02:54.